After you install the Module for WebSocket Testing, a new option appears in the Recording Options dialog. It is "Allow recording of WebSocket connections". By default it is turned on and WAPT Recorder supports the recording of WebSockets. This dialog appears after you click the Rec button on WAPT toolbar. 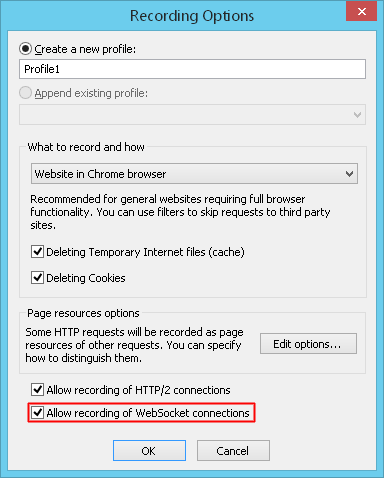 Note that you should use an external browser to record WebSocket connections. Choose a desired browser in the corresponding combo-box of this dialog. Recorder creates a WebSocket Connect item and a number of WebSocket Request items in a profile. The number of Request items is equal to the number of messages sent to the corresponding socket. Request items are displayed in the tree view in the chronological order. Received messages are also recorded and saved in the chronological order together with the sent messages in the WebSocket Connect item.